The only manufacturer of competition ropes, ranch ropes, and kid ropes in Kansas, Choo Choo ropes was started in 1984 to supplement owner, Dean Rich's farm income. Choo Choo Ropes is a family owned and operated business of CC Enterprises which also includes Complete Cowboy. Dean's son-in-law, Clay Newkirk, works full time with Dean's daughter and grandchildren helping in the summer. All the companies begin with the letter C to honor Dean's father, Charlie. During the fair and rodeo season, Dean, Clay, and Dean's wife, Charlotte are on the road selling the ropes, hats, spurs, and other rodeo equipment. 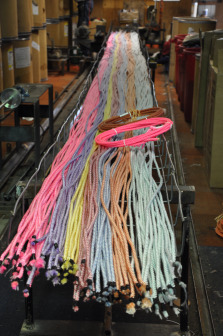 When not on the road, they can be found manufacturing their ropes in Gridley. The process involves dying the threads, weaving, cutting, waxing, knotting, and finishing the ropes. They not only sell retail, but to wholesalers around the country. The pink ropes are their biggest sellers. Since they are on the road part of the year, it is best to call ahead to see if they are in town. Ropes and other gear maybe purchased at their site in Gridley.